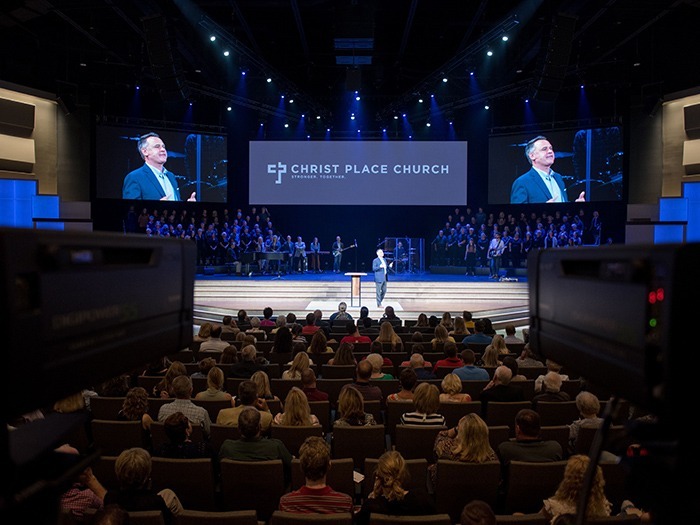 What started out as a way to serve its more than 8,000 members, Christ Place Church, formerly Blackshear Place Baptist Church planned to build a new worship centre on its property. Now, the project has just held its first services in September after two years of construction. This modern, state-of-art building which included 78,000 square feet of new construction with a 2,000-seat worship centre has greatly strengthened the capacity of serving its growing congregation. 80 feet of LED screens, in total 99.5 sq metres (1071 sq ft) were installed on the stage, offering stunning visual images. The project solution is provided by Georgia based company PRODUCTION/co, formally known as Cason Cleveland Productions. In this new worship centre, Christ Place Church expected ‘production that not only looks great but is also flexible in its use and easy to service.’ PRODUCTION/co has been specialised in providing amazing customer service and in maximising available resources for maximum impact. After researching and discussing, the church and PRODUCTION/co reached the decision of purchasing Unilumin UpadIII. Unilumin UpadIII perfectly met the demands in this project – creative design, image quality, and easy assembly. “When there is an issue on a Sunday morning you need to be able to correct the problems as fast as possible, even using volunteers to do so at times,” said Dustin Whitt of PRODUCTION/co. “In the past, we have dealt with panels that were difficult to service. The magnetic modules in the Unilumin panel were a big selling point.” This winner of 2016 WFX New Product Award is able to create an outstanding performance while guaranteeing a fast and simple installation. The slogan ‘One, For All’ well explains its features of one-person installation and disassembly, one-person maintenance, and one-panel available for concave and convex curves. As a high definition screen with lower cost, UpadIII best fits the vision and budget of churches and houses of worship. “Pastor (Jeff Crook), he preaches and has a lot of facial expressions and we want people to be able to engage with him as he teaches the word of God,” said Stephen Odum, creative director at Christ Place. “We want them to be able to connect with him visually. So we’ll be able to do that with the new screens and cameras that are there.” The screen attracts, inspires, and engages the entire congregation with visually impactful worship experience, even members from the back seats can get the clear vision of the pastor.